In this exhibition, Lonnie plays with notions of windows and drapes and what we see and don't see. Continuing with her signature cut-out works in black builders paper, and the interaction of positive and negative forms, she has created a fresh range of motifs - geometric, architectural, botanical and natural - to create works that speak to deep connections of genealogy, place and history. 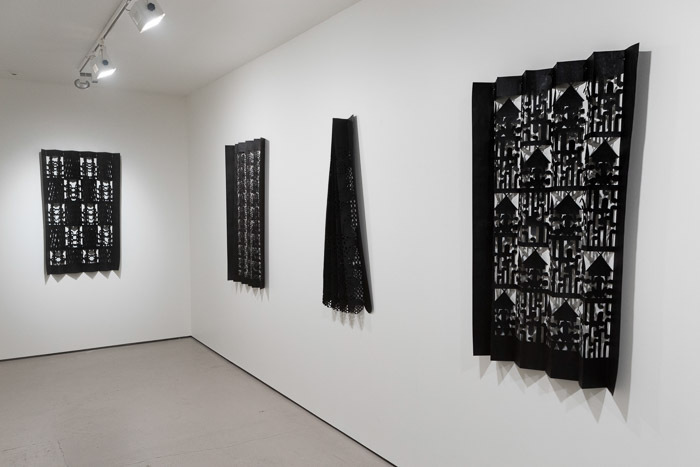 Disrupting materially and conceptually, foundational concepts of painting as a window on a world, her layered window dressings suggest metaphysical landscapes and imaginary gardens that include the sun, stars and - with the employment of the poutama tukutuku pattern -stairways to the heavens. Redolent in narratives at once universal and culturally specific, Lonnie's work contains an underlying politic in its feminist celebration of the work of women and its articulation of a non-western, Polynesian worldview that can only be seen by those with appropriate knowledge. Lonnie has exhibited extensively nationally and internationally and has work held in wide-ranging major public and private collections. Earlier this year a major new work was commissioned for Kaleidoscope: Abstract Aotearoa - one of the new exhibitions in the relaunch of Toi Art at the Museum of New Zealand Te Papa Tongarewa. She has also developed several major, temporary and permanent, public art works including most recently a seven metre billboard commissioned by Christchurch Art Gallery to mark the 125th anniversary of women's suffrage in New Zealand. Lonnie has dedicated this exhibition Siaosi Mulipola a dancer, choreographer "and spreader of cheer and smiles". The titles of the works are taken from some of his favourite songs. RIL.